Venezuela: Who is Juan Guaidó? | Fight Back! 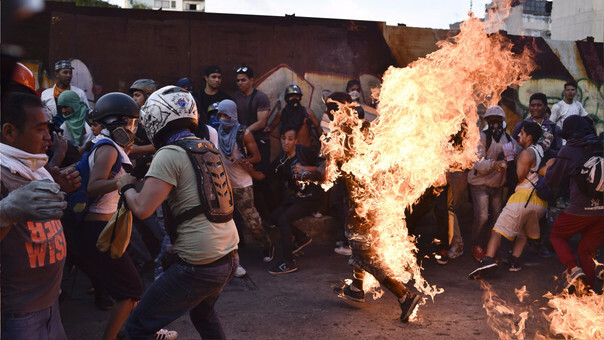 Orlando Figuera, burned alive by pro U.S. Venezuelan opposition. Chicago, IL - On January 11, the illegal National Assembly of Venezuela decided to ignore the inauguration of Nicolás Maduro and appointed Juan Guaidó, their leader, as the true president of the country. They say that the Constitution grants the nation's highest legislative body the right to appoint a president in the event of a power "vacuum." This move has won the support of the Organization of American States (OAS), the fascist president of Brazil Jair Bolsonaro, and U.S. Vice President Mike Pence. Guaidó embraced the appointment and has called on the Venezuelan military and the people to support his claim. Neither have done this. Why? For one, support for Guaidó and the National Assembly ends at the mansion gates. Their authority was stripped by the Supreme Court for refusing to remove illegally elected deputies and refusing to recognize presidential authority. Guaidó's main support now comes from the wealthy elite - many now living in Bogotá, Colombia or Miami - who have had their political and economic power eroded by 20 years of the popular Bolivarian Revolution. But more than anything, Juan Guaidó, his political party Popular Will, and the entire opposition are opposed by Venezuelans because they have more blood on their hands. No one has forgotten what they did in the spring of 2017. After the Supreme Court took away their authority, the opposition gave up on achieving change through the democratic system and instead turned to overthrowing the Maduro government through violence. They organized the infamous guarimbas, street blockades enforced through bullets and bombs in every Venezuelan city. Nearly 200 innocent people were murdered in the violence, including the young Orlando Figuera (see accompanying photo). The violence only came to an end when Maduro called for the founding of a constituent assembly, which was elected in July with the largest-ever voting total in favor of the Bolivarian movement in the course of its history. The Constituent National Assembly is now the highest legislative body in the land, leaving the National Assembly without any power, a lonely group of some rich people griping in a room. The violence of 2017 permanently divided the opposition from the Venezuelan people. In every election since then - free, fair, internationally observed and with less questionable results than our country's most recent midterms - the United Socialist Party and its allies have won by huge majorities. It was during this wave of victories that Maduro was re-elected president with over 67% of the vote, against a number of opposition candidates who could not unite themselves on a common ticket. Popular Will - the party of which Guaidó is a co-founder, and a main organizer of the 2017 violence - refused to run in these elections. Instead, they continue to call for the overthrow of Maduro, but, recognizing that there is no popular support for this idea in Venezuela, instead call on the United States and its proxy states to do it for them. Now, Guaidó is known not only as a leader of the guarimbas, but a politician willing to invite foreign invasion who win what he cannot win by democratic means. If you believe in popular rule and the right of nations to decide their own destinies, then you have no business supporting Guaidó. He is a usurper, a foreign puppet, and someone with a deep hatred for the tens of millions of poor, working-class Venezuelans who have dared to stand up and demand a better world. Guaidó and his band of fools chose to abandon their nation. Nicolás Maduro represents the hope for a better future. We must stand against this anti-democratic move that can only lead to total war, and defend the Venezuelan people from the cruel machinations of the Trump government and its Latin American puppets.